Whatever the reason, though, home presentation is a cornerstone of the real estate services we provide as brokers, and that sellers expect as clients. 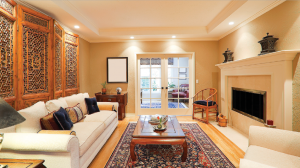 Every homeowner can benefit from basic staging techniques. Regardless of your price point, you and your agent should work at presenting your home in the best possible light to potential home buyers. Indeed, most of the benefit of staging is really just “detailing,” the way that you’d detail your car if you were selling it. You wouldn’t try to sell your car all dirty and cluttered up with stuff in the trunk. You’d clean it up, polish it, get rid of all the clutter. Clear out every cabinet, bookcase, and closet of anything you don’t use regularly, and anything that you don’t think you’ll need over the next six months. Take all the other stuff and either give it away, sell it, or store it. That will make your home look bigger. Reduce your clothes closet to your “vacation-plus” wardrobe: your favorite outfits that you would take with you if you were going away for a week, with some extras in case you don’t get to your laundry promptly enough. If it doesn’t fit, get rid of it. Clean every part of your home, or hire someone to do it for you. Pay special attention to first impressions like the main front door (the one you never use because you always come through the garage, so you don’t realize that you’ve got cobwebs and dirt and stuff all over it). Clean clean clean! In other words, if you’re going to be moving anyway, START NOW! Get part of your move out of the way right now, because it will save you time later and make your home much more attractive to buyers. I personally saw the impact that staging can have on a home sale. When I sold my condo in Nyack, I staged it right from the beginning, taking out about a 20×20 storage container worth of furniture, old books, clothes, and everything else I wouldn’t need while the home was on the market. But I was still living there with two small kids, so the place was still cluttered up with the detritus that follows them everywhere like PigPen in the Peanuts cartoon. About a year after we put it on the market, we went away to the shore for a month, and took that opportunity to clear out all the kids stuff, at least for the month. And that made a difference — we had an accepted offer in two weeks. It really makes a difference. Your Rand agent can provide you with a host of materials that we’ve created to help guide you through this process. We believe that all our real estate agents should be as accomplished at staging as they are at pricing, marketing, counseling, communication, and managing a client’s transaction — the core services we provide to sellers. Indeed, we’re delighted that in the next month to welcome the great Martha Webb to deliver to all 1,000 agents at Better Homes and Gardens Real Estate | Rand Realty both the national Certified Home Marketing Specialist course and the Better Homes and Gardens Real Estate Staging Certification. We’re committed to making staging a cornerstone service for our clients, so make sure you take advantage of it when you list your home with us.